Be sure to read the precautionary notices concerning the srs airbag system before servicing it (see page rs-1). Detach the wire harness clamp from bracket. Disconnect the connector from the airbag. 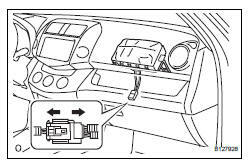 When handling the airbag connector, do not damage the airbag wire harness. Remove the 2 bolts from the reinforcement. Remove the instrument panel upper (see page ip- 6). Release the front side airbag door from the front side hook by slightly bending it and lift out the front passenger airbag rearward. 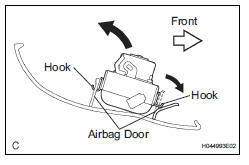 Release the rear side airbag door from the other hook and remove the front passenger airbag.